It’s that time of the year. Time to open up the house to air it out from the winter yuck. It’s spring cleaning time. I love this time of year. It’s like starting fresh by getting rid of the old, unused, broken, too little, too big and just don’t want anymore, junk and making everything smell good and sparkle. Time to clean out the house and garage. This is a great opportunity for you to plan that garage sale too. While you’re are sorting through the things you want to remove from the house, you can also price the items and put them in boxes/totes till you are ready for your sale. Spring cleaning can be time consuming and intimidating. Be prepared. Make a list of things you will need. Such as: cleaning supplies, rubber gloves, boxes/totes, tape, markers and recruit some help. As my mom would say, “many hands make light work”. Schedule the time you want to start and think about how long you want to invest every day. If you are wanting to get everything done in a weekend, you will need help and expect to spend the whole weekend getting this project done. If you are going to take a few weekends, you can break it down by how much time you want to spend and what rooms will be tackled first. I suggest doing the worst room first. You have the energy and are excited to get started. This will help you stay on track and will encourage you to continue with the rest of the house. KITCHEN: In the kitchen it’s best to work from the top down. Start with the upper cabinets, do one at a time. Take everything out and wipe out the cabinet, put new shelf paper in and replace items you want to keep. (If it’s broke, it goes in the trash, if you don’t use it or don’t want it, it can be marked for garage sale or charity. Continue this routine for each upper cabinet. Then you can do the counter tops, sink, walls and back splash. Clean thoroughly. Then do the lower cabinets the same way. Now comes the yucky part. Cleaning the appliances. Just do one at a time unless you have help. Clean out the old food from the fringe and clean each shelf and the doors. If you have an older stove/oven combo, don’t forget to clean under the burners. Then the only thing is left is the floor, and we all know how to sweep and mop, just don’t forget to pull out the appliances to clean there too. If the floors are bad, you may have to go ‘old school’, getting on your hands and knees with a bucket of hot soapy water. BATHROOM(s): For me, bathrooms are second on the list. Take things off the walls, like pictures and remove towels from hooks/holders and remove rugs. Just like the kitchen, start at the top and work your way down. Start with the walls. Give them a good scrubbing. Since you are starting with the walls when you reach the shower/tub area, do the shower/tub next. If you have a vanity or small sink with a counter, do this next, clean off the surface. This is a good time to start sorting your keep/sale/charity items. Get rid of outdated shampoo, make-up, lotion, perfume, and shaving cream. Medicine cabinets, need to be cleaned out too. Check the dates on any medications. If out of date, they need to be disposed of properly. Do not throw these in the trash can or flush down the toilet. TIP: Proper disposal of medications is important. You don’t want to contaminate the water or have a person or pet eat something they shouldn’t. According to the U.S. Food and Drug Administration website, they say to follow the directions that are on the bottle or paperwork given to dispose the medication. If there are no instructions given, they suggest using used coffee grounds or kitty litter. Remove medicine from bottle and place these in a zip bag with the coffee or kitty litter. Zip up the bag and then throw away. If these are not options for you, please call your local pharmacist for instructions. Since the vanity is cleaned off, you can now do the linen closet. If yours is like mine it doesn’t just hold towels. I’ve got everything in there, brushes, combs, toothpaste, toilet paper, razors, blow-dryers, the list goes on. Really sort through all of this. Do you really need 2 hair dryers? Only keep what is necessary and used every week. TIP: Don’t get rid of those old towels that have holes. Cut them up into smaller pieces and use for rags to clean windows, wash the car, or keep in the garage. They will come in handy. It’s another yucky, the toilet. Don’t forget to clean the back and the base. These 2 areas tend to be the yuckiest. Lastly it’s cleaning the floor. Same thing as the kitchen. Sweep and mop. LIVING ROOM: This room requires some heavy lifting, you might want to have a buddy help you. Start with the dusting. While you are dusting EVERYTHING, keep in mind if the items you touch belong there or if you still want it. If it doesn’t belong, take it back to its home, if you no longer want the item, place in the sale or charity box. I will tell you what my mom says about dusting, don’t just move the dirt around, and really get it clean. Clean out the TV cabinet, get rid of those movies you don’t watch any more. Get all the cob webs down, even behind the couch, chairs and TV cabinet. Clean the dust and cob webs that may have built up on your electric cords. Those can be a fire hazard. This is when you will need that buddy to help you move the furniture. Move the furniture to sweep under everything and up against the walls. Since all the furniture is being moved, wipe down the base boards too. Don’t forget to take down the paintings/pictures to clean the frames and glass. BEDROOM: Let’s start with the biggest part of the room…the closet. Remove everything from the closet. Now start going through your clothes and shoes. If you haven’t worn an item in this season, it’s time to go. If it still has a tag on it and hasn’t been worn in the past 6 weeks…time to let it go. If it no longer fits…bye-bye. If you no longer like the item….gone. Put all unwanted clothes and shoes in your garage sale or charity boxes as you go. Sweep out closet and wipe down shelves. Now put clothes back in closet. You can sort them by color, all pants and then shirts or by season. I bet you will think, now it’s time to go shopping for new clothes because the closets seems empty now. Then I would go through the dresser drawers. Do the same thing as the closet. If it doesn’t fit, haven’t worn, no longer like, it’s time for them to find a new home. Clean out your night stands too. Dust of all dressers and night stands. Now you have room to organize the drawers. This will feel so good because you will no longer have to open 2-3 drawers before you find the item you were looking for. Don’t forget under the bed. Same rules apply. If it hasn’t been worn or used in a long time…it’s time for a new home. Take all bedding off and wash them. Use your sweeper and sweep the mattress, yes I am saying sweep the mattress, it helps keep it fresh and those things get dirty. After sweeping you can spray it with Lysol or Fabreze to freshen it up. If your curtains are washable, remove them and wash. If not washable, remove and take to dry cleaner. Sweep the floor and move dressers to sweep under them. Put clean sheets and blankets on bed. ENTRY/HALL CLOSETS: The first thing you want to do is remove everything from the closet. Start with a clean slate. Go through all the hanging clothes and whatever doesn’t make it back into the closet either goes to garage sale, charity or trash. A good rule to follow for coats/jackets is, if you haven’t worn it in a year, it’s time for that item to have a new home. If your entry closet is like mine, I have shoes, winter items, summer items, games and my sweeper. You will need to apply the same rule for the coats/jackets to the shoes, hats, gloves, saddles and scarves. Only keep what you know you will wear. If you keep family pictures, games, umbrellas on the shelf this is a great time to get them sorted too. If you haven’t played the game in a year, I think it needs a new home, so someone else can play. TIPS: Don’t forget to clean the overhead light fixtures and ceiling fans. You can dust the light bulbs or replace the ones that have blown out. Min-Blinds can be taken down and cleaned. You can take them outside and use the garden hose or you can use your shower to given them a scrub. Make sure they are dry before you rehang. Take your charity box where it needs to be as soon as you can. No need for the box(s) to hang around in the house and be shuffled around. Take the trash to the dumpster or curb ASAP. Plan dinner ahead of time. You will be tired and you don’t want to cook after all that hard work. Let me know how your spring cleaning went. 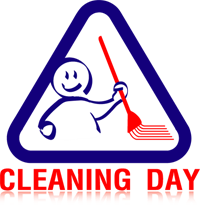 Categories: Helpful Tips | Tags: cleaning routine, Helpful tips, Ideas, Spring cleaning | Permalink. Thanks Cheryl, I’m glad you liked the post. I hope it helps.